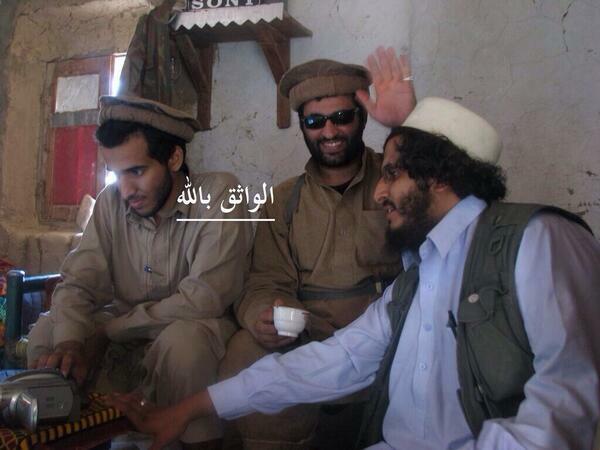 Sanafi al Nasr, a senior al Qaeda strategist, is a part of the so-called “Khorasan group.” Nasr is sitting on the far left in the picture above. Al Qaeda’s so-called “Khorasan group,” which was struck in the US-led bombing campaign earlier this week, is run by senior jihadists dispatched to Syria by Ayman al Zawahiri. One member of the group, a veteran al Qaeda operative named Muhsin al Fadhli, has been publicly identified. But several US intelligence officials contacted by The Long War Journal have confirmed that another well-known al Qaeda bigwig, a Saudi known as Sanafi al Nasr, is also a leader in the group. And, like al Fadhli, Nasr once served as the head of al Qaeda’s Iran-based network. In March, The Long War Journal first reported that Nasr is a senior al Qaeda leader. US intelligence officials explained at the time that he was involved in al Qaeda’s strategic planning and policies. Five months later, in August, the US Treasury Department designated Nasr, noting that he is a “key” al Qaeda financier, as well as one of the Al Nusrah Front’s “top strategists.” Treasury also said that Nasr became a “senior” leader in Al Nusrah, an official branch of al Qaeda, after relocating to Syria in the spring 2013. Nasr, whose real name is Abdul Mohsin Abdullah Ibrahim Al Sharikh, has an active Twitter feed with more than 23,000 followers. In tweets posted since early 2013, Nasr has revealed a number of details concerning al Qaeda’s operations. In one tweet, for instance, he explained that al Qaeda’s senior leadership decided to deploy trusted veterans to Syria, where they were embedded within both the Al Nusrah Front and Ahrar al Sham. Nasr’s tweet was one of the first public hints regarding al Qaeda’s plans. Nasr has been closely tied to the leadership of Ahrar al Sham, a rebel group in Syria that fights alongside Nusrah on a regular basis. Ahrar al Sham is the most powerful organization in the Islamic Front, a coalition of several groups. It was cofounded by Abu Khalid al Suri, a veteran al Qaeda operative who served as Ayman al Zawahiri’s representative in Syria until he was killed in February. Much of Ahrar al Sham’s leadership was killed in an explosion earlier this month. After they were killed, Nasr changed the header on his Twitter feed to an image honoring the slain jihadists. US officials have stressed that al Qaeda’s “Khorasan group” was planning attacks in the West and possibly against the US homeland. “Intelligence reports indicated that the group was in the final stages of plans to execute major attacks against western targets and potentially the US homeland,” Lieutenant General William Mayville, director of operations for the US Joint Chiefs of Staff, explained to reporters. Other US officials have said the same. Although he is relatively young, Nasr is an al Qaeda veteran. He first began contributing to jihadist forums and websites roughly a decade ago. Nasr was groomed for his position within al Qaeda, in part, because of his jihadist pedigree. Several of Nasr’s brothers, two of whom were once detained at Guantanamo, joined al Qaeda. Some of Nasr’s other family members, including his father, have also been tied to al Qaeda. Indeed, according to US intelligence officials, Nasr is one of Osama bin Laden’s third cousins and his family bonds have made it easier for Nasr to keep the trust of al Qaeda’s Gulf donors. Cash has flowed through Nasr into al Qaeda’s coffers. Nasr is so respected within al Qaeda that he was tasked with managing its deal with the Iranian regime, which is one of the organization’s most sensitive relationships. In early 2013, according to Treasury, Nasr temporarily served as the head of al Qaeda’s Iran-based network. Al Qaeda’s presence in Iran is the result of a formerly “secret deal” between the Iranian government and the terrorist organization. Nasr’s ties to Iran may help to explain why, according to the US Treasury and State Departments, the Iranian regime continues to allow al Qaeda to funnel fighters to the Al Nusrah Front in Syria. Al Nusrah is fighting in Syria against Bashar al Assad’s regime and Hezbollah, both of which are backed by the Iranians. Given their opposition to each other in Syria, the ongoing relationship between al Qaeda and the Iranians is somewhat of a mystery. It is so well-known in jihadist circles that Nasr was based in Iran for a time that supporters of the Islamic State have even criticized Nasr’s Iran ties on social media. Nasr has repeatedly criticized the Islamic State, which was part of al Qaeda’s international network before being disowned by al Qaeda’s general command. Like Muhsin al Fadhli, another leader in the “Khorasan group” and former head of al Qaeda in Iran, Nasr was redeployed to Syria in 2013. Other al Qaeda operatives who joined the Khorasan group have come from around the world, including from Afghanistan, Pakistan, Chechnya, and North Africa, according to The New York Times. If this “Khorosan Group” was indeed in its final stages of a potential attack against CONUS, wouldn’t it have made more sense to render some of them instead of killing both them and any chance of developing a better understanding of suspected operation? If the operation was/is as advanced as Kirby purports, wouldn’t those charged with carrying it out still be active? strikes in Raqqa and Mosul than to bomb Tora Bora.